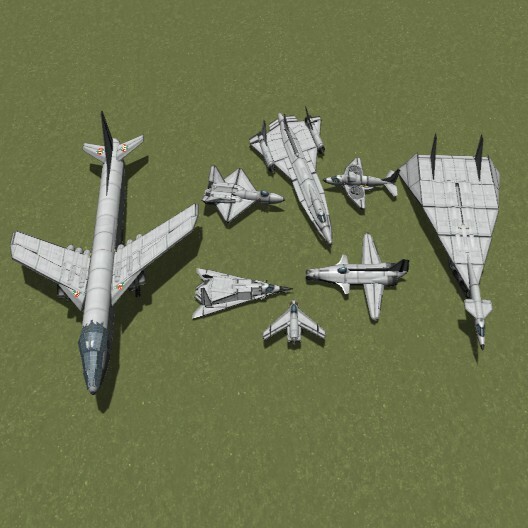 Like the title suggests, this pack contains 8 planes from history that are strange and futuristic but didnt make it into production. Junkers EF 128 (bottom center). a small fighter dreamed up by the nazis during late WW2 as a last ditch small jet fighter. please dont mind the small tail, i was having issues with the control surfaces. YF-23 (top left). Developement started in 1991 specifically to beat the F-22, this Futuristic looking aircraft was better in nearly every way, But the Air Force cancelled it due to politics and cost. Ryan XV-5A (top right). Designed in 1962 as a proof of concept, this VTOL plane was powered of one X-353 turbine (i think) She flies pretty rough if you dont know how. First, engage brakes, then hit 2 with full throttle. try to keep at least -10 on your NavBall. keep track of your vertical speed. once you've reached a somewhat stable course, hit 1. when the speed is about 60 m/s, hit 2. after that, take it slow and you'll be fine. LASRE-SR-71 (top center). NASA outfitted a SR-71 with an experimental linear aerospike (i suggest reading up on the function) Basically, instead of an engine bell, an aerospike uses air pressure/flow to channel thrust, since the SR-71 was the fastest air breathing manned plane, it was the obvious test vehicle. XB-70A Valkyrie (far right) Developed as a supersonic bomber in the mid 1960's with the goal of mach 3+ nuclear bombing capability in mind, it became obsolete with the advent of ICBMs and was relegated to research flights.